The spectacular mountain and Blyde River Canyon scenery took my breath away. I sat at the bottom of the garden under the trees, just gazing up at the mountains but keeping a wary eye out for hippos in the small dam. The garden is delightful - peaceful and full of birds. 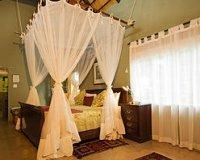 The perfect place to explore the Canyon, and close to Kruger. The Drakensberg mountains rise magnificently, forming the lip of the Blyde River Canyon, just past Blyde Mountain's garden. Blyde Mountain's thatched buildings are tucked away between citrus and mango estates, enhancing privacy and peace, surrounded by indigenous bird-inhabited trees and a carefully balanced garden with lapa and swimming pool. 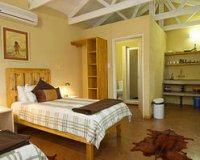 Creative and artistic rooms range in size and style, including family units and self catering cottages. 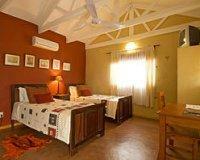 All rooms have private entrances, DSTV, tea and coffee tray, airconditioning and garden or mountain views. Dinners by prior arrangement. Functions, conferences and weddings are catered for. 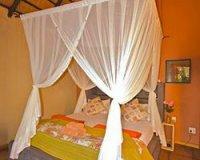 Nearby activities include canyon hiking, hot-air ballooning, rafting, cruises, birding and hippo watching. Kruger Park is 40 minutes away and Hoedspruit’s Eastgate Airport, with daily flights to Johannesburg and Cape Town, is 20km away. When you make a booking for four people or more staying a minimum of two nights, every 4th person in the family or group will stay for FREE. Valid until end August 2019. "Dear Portfolio Team, Thank you very much for an extraordinary journey to South Africa. 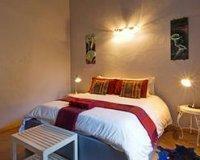 All accommodations of the Portfolio Collection were first-class, homely and full of personally engagement. We will come back and certainly choose the Portfolio Collection again! With my best regards, "
"A big thank you to the staff of Blyde mountain country house, the place was spectacular, the views were breathtaking to wake up to. The staff members were really friendly and welcoming. 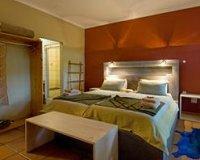 The cleanliness of the accommodation was a big plus. couldn't have asked for a better place to enjoy this long weekend. they will most definitely be seeing us soon." "Very comfortable with helpful management and excellent breakfasts." 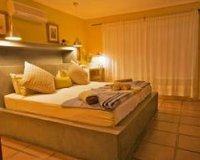 "A very good athmosphere, we felt we were welcome at Zuleika. Nice cottages and beautyfull garden. 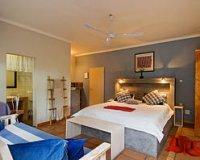 We enjoyed our stay very much." "We attended a wedding in the area so had just one night - unfortunately! The welcome by Megan was warm and wonderful - made us feel right at home! 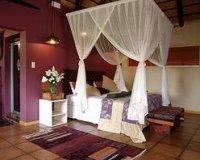 Room was fabulous - comfortable and so pretty - think it may have been the honeymoon suite?!! Had a delicious breakfast before leaving to go back into the Kruger Park. Thank you Megan for making us feel special at your lovely guest house! Will certainly recommend it!!" "we stayed in room no. 10 which is a standard room. Nice room with a large bath. Except the everything looked modern and stylish. Lovely breakfast and great dinner. Blyde River Canyon is next and we have to drive for 45 minutes to reach the Orpen Gate from Krugerpark. 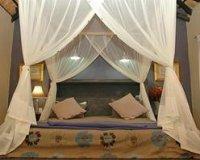 We really enjoyed the stay and extended for two additional nights." Drive through Klaserie, a small rural settlement and get to a T-Junction showing Hoedspruit to the right, KEEP GOING STRAIGHT. After about 20 km you will see a sign for Swadini on your left, keep going straight. After about 7 km you will find another T-Junction towards Hoedspruit, ignore that too. Keep going until you see "Hoedspruit Angling Club" on the right. Blyde Mountain Country House is less than 1 km from there on your left, the same entrance as Otters Den. Big white wall with our logo on it. Don’t worry, it is very well sign posted!. S24° 24' 0.35" E30° 49' 3.09"